PT Angkasa Pura Support - PT APS or referred to as "Angkasa Pura Support" is a member of state-owned airport operator PT Angkasa Pura I (Persero) that is involved in airport supporting services. Angkasa Pura Support operates primarily as a supporting company for aviation industry. Its business include Services, Equipment, and Information Communication Technology (ICT). Angkasa Pura Support is one among five subsidiaries of PT Angkasa Pura I (Persero) or Angkasapura Airports Group. As of December 2016, PT Angkasa Pura Support is 99.61% owned by PT Angkasa Pura I (Persero) and 0.39% by PUSKOPKAR AP I. PT Angkasa Pura Support was formed to supports PT Angkasa Pura I (Persero) in order to provide the best services to the passengers or visitors of airports which manage by PT Angkasa Pura I (Persero). PT Angkasa Pura Support is based in Jakarta and its head office is registered at Gedung Center for Excellence, Jl Tabing No 16, Kemayoran Jakarta 10610. 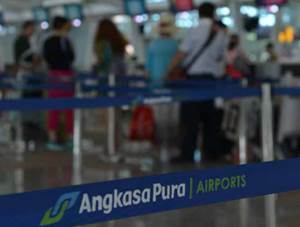 Angkasa Pura Suport booked positive growth in 2015. According to PT Angkasa Pura I (Persero) Annual Report 2015 as cited by JobsCDC.com, total assets of Angkasa Pura Suport booked total assers of Rp 379.13 billion in 2015 or increased by 42.58% from Rp 265.91 billion in 2014. Referring to its annual report, total profit after tax of Angkasa Pura Support in 2015 amounted to Rp 40.98 billion or an increase of 54.97% compared with the previous year. Male (1), Male/Female (2, 3). Minimum height of 170 cm and proportional weight (1). Minimum SMA IPA or SMK Electrical, Mechanical, Automotive and Electricity (1). Minimum SMA/SMK all majors (2). Not color blind, not tattooed and not involved in drugs or illegal drugs as evidenced by a certificate from a doctor/attach a medical certificate from Government Hospital (1, 2, 3). Have good behavior and attach SKCK (1, 2, 3). Take the psychological test, SAMAPTA / Physical test, interview and health test (1). Take the psychological test and interview (2, 3). Willing to follow the PKP-PK Basic Training at their own expense (1). Willing to be placed throughout the airport of PT Angkasa Pura I (Persero) (1, 2, 3). JobsCDC.com now available on android device. Download now on Google Play here. Please be aware of recruitment fraud. The entire stage of this selection process is free of charge. 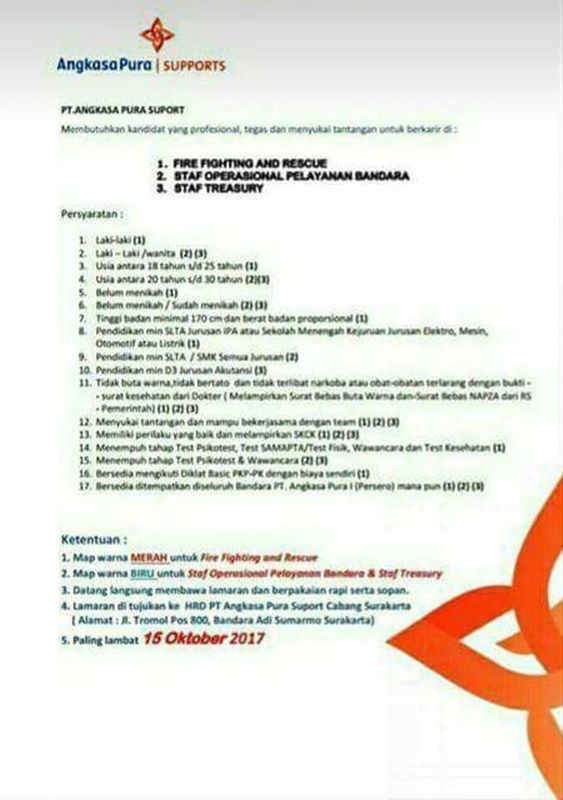 PT Angkasa Pura Support - Fire Fighting and Rescue, Operational Staff, Treasury Staff Angkasa Pura Group October 2017 will never ask for fees or upfront payments for any purposes during the recruitment process such as transportation and accommodation.